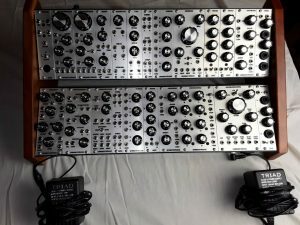 ” Pittsburgh Modular Synthesizer CELL (90) FOUNDATION COMPLETE SYSTEM. I think this was purchased in 2015 or 2016. Sparingly used in home studio. The Cell Foundation Desktop is a fully modular, eurorack, analog synthesizer. A patchable system styled after the great monosynths of the past with no hardwired signal path or fixed voice architecture to restrict creativity. Driven by two wide range analog oscillators the Foundation produces a huge, warm sound that can’t be matched by digital or VST synths. All of the elements of a classic voltage controlled synthesizer are available as an open, patchable, modern synth. The Foundation is a “complete voice”. It contains all the modules needed to produce a wide variety of complex sounds such as monster analog bass, cutting leads, evolving pads, and short percussive hits. All of which can be controlled directly using the Foundations’ 45 knobs and switches then played with any standard Midi controller. The Midi module included in the Foundation allows for monophonic / duophonic / and dual monophonic patching for maximum flexability.